I’m Jess, and I’m a nonbinary/genderqueer software developer. I moved to London having not climbed since I was a child, and climbing with co-workers reminded me how much I liked it. I love the combination of individual challenge and social teamwork. It is good exercise, but you hardly notice – the puzzle and challenge means it’s never boring. I found Not So Trad on a directory of LGBT sports clubs and arranged to go to an NST beginner’s night. I immediately felt at home. I was paired up with friendly and encouraging climbers and got to climb on top-rope immediately. Everyone felt welcoming and safe to climb with. Soon I was ready to join the club and come to non-beginner indoor meets. It’s great to come to the wall confident that there will be someone to climb with. The fact that it’s an LGBT club makes it easier to get to know people – there’s so much you don’t have to explain. You’re not a novelty as an LGBT person. After the session, there’s usually a good crowd in the pub too! 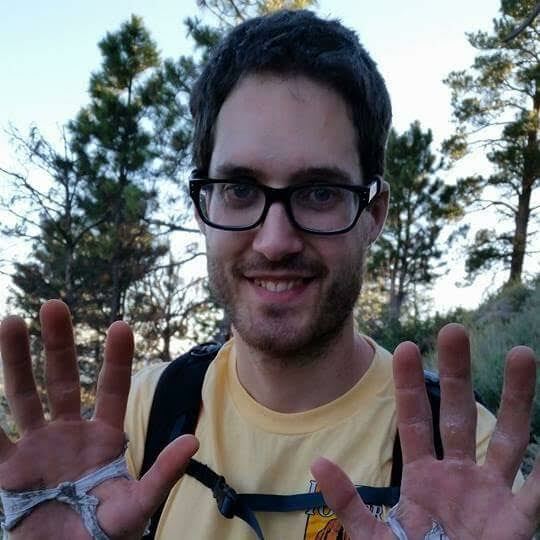 Not So Trad puts a lot of work into helping people who want to start climbing outdoors. Every step, the organisers and other members have been encouraging and inclusive. The First Time On Rock trips do what they say on the tin. 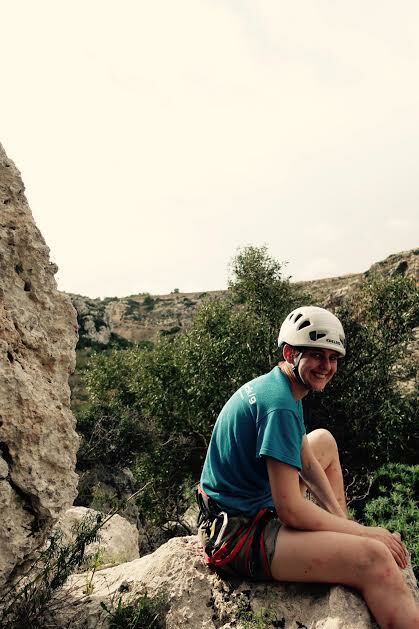 I learnt to climb on real rock, and felt safe without feeling like a burden on the other climbers. Since then I’ve been on trips to Malta and France – it’s great to combine climbing with visiting new places and making new friends. I’ve been climbing now for around ten years with many ups and downs! My first experiences were freezing winter days at Stanage Edge and daunting tall indoor walls. I enjoy Trad and Sport climbing the most and sometimes go bouldering if I can’t find any partners. I really enjoy the mind control aspect of Trad climbing- pushing through pre conceived limits and coming out the other end safe. Sport climbing feels safer mentally so I can really push my physical limits. Bouldering puts a spotlight on weaknesses which can sometimes be frustrating to deal with but when it comes together and I have good friends around it can be great fun. My main aspirations in climbing atm are for long Sport multi pitch climbs. The adventure and exposure tend to lead to an unforgettable experiences. I would also like to try big walls to improve my ropework, efficiency and sleep on the side of a cliff. Not So Trad really made my life worthwhile when I moved south for a new job. I was really made to feel welcome and I didn’t feel judged. I came into the club with experience but everyone is treated equally. It was great to be around like minded people and be inspired by everyone’s varied stories and life. The weekly indoor meet was a highlight of my week and the pub social afterwards really helps bring us all together after a training session. Crucially I was keen to get on as many outdoor trips as possible. I’ve been all over the UK and abroad and helped pass knowledge onto new and less experienced members. Most importantly I made lots of great friends for life who are incredibly generous kind people. If you’re new to climbing there is lots to learn. Be patient as the rewards may not be immediate. Jump in, say hello, come to the pub after and come on some trips. It’ll probably be the best thing you ever do! I joined Not So Trad 6 years ago. I’d got injured in my previous sport & wanted to find something new and meet more LGBTQ people. I hadn’t climbed before except to do a 5 hour course at the Castle to learn to belay and some basics. It was all a bit of an experiment and I wasn’t sure I’d like it. Six months down the line I was addicted, going on one or two outdoor trips most months and climbing indoors several times a week. Things have changed somewhat recently, I’m now the mother of a 7 month old baby girl & my climbing is rather more limited, but we’ve still been on two trips this year. What I love most about Not so Trad is the people. I’ve made some firm friends and have been on some truly fantastic holidays with the club. I like that it is a club that has been able to cater for me at all stages – beginner, ridiculous enthusiast and more recently mother, potterer and cake lover! 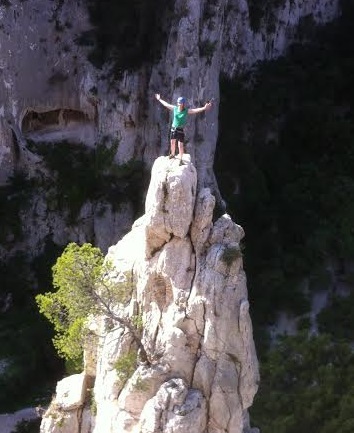 Climbing has also really introduced me to the great outdoors and I have been to many beautiful places both in the UK and Europe that I had no idea about before. All in all I think it’s safe to say that the experiment proved to be more than a success and Not so Trad has influenced me in many positive ways over the last 6 years. In November 2015 two of our members, Martin and Roslyn were interviewed by UKClimbing (the UK’s most popular climbing website) for an article about LGBT climbers. Read an excerpt here.